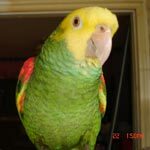 Parrot Forum • View topic - How to make my budgie stay on finger? With the targeting methods of the trained parrot blog I managed to make my budgie hop on to my finger when she's motivated. The problem is she hops off immediately after getting her treat, or when I wait longer then usually with giving the treat. Any tips? Thanks! Re: How to make my budgie stay on finger? How long have you had it? How old is it? What do you feed it? What is your light schedule? What is the bird's name? We refer to our birds by name. liz wrote: How long have you had it? How old is it? What do you feed it? What is your light schedule? What is the bird's name? We refer to our birds by name. I'm sorry, new to the forum. I've had Dido since the 18th of May 2018, so that's 4 months. I don't have the exact date of birth, but I was told she was 10 weeks old when I got her. I guess Dido's almost 7 months old now. Dido's diet consists of seeds, and I'm doing everything I can to get her to eat veggies and pellets. Today I started another plan of converting her to pellets by placing a cup of seeds (1 teaspoon) low in the cage every morning and evening (taking it out in afternoon) while keeping pellets available all the time at the highest perch. I care a lot about my birds' wellbeing so I'm willing to give it all to get them those vitamins they need. I expose my budgie to light from 9 am to 9 pm. No 'horrible entrance' at all! Welcome to the forum, Ralf and Dido! Now, the diet is not very good. Nothing wrong with feeding budgies seeds as long as they are the right kind but, in my personal opinion and experience, it's much easier to feed them gloop and greens than to go through all the gyrations of trying to convince them to eat healthy stuff along with the seeds on their own. Right now, I only have seven budgies, four females and three males, so I do need another male to make 'things' even but I've had one of my sons and his family staying over for a visit and I had no time to look around for one that might need a good home [I never buy baby birds, I take in the ones that other people don't want and, with budgies, it's an easy thing to do because people are always buying some and then giving them away]. I feed mine gloop with a piece of fruit or veggie [it depends on what they like best of the ones I have for the day] for breakfast and all day picking and ABBA 1600 for dinner [they also get ABBA's multivitamin/mineral supplement twice a week and have cuttlebone in their cage all the time]. Gloop is a dish made out of cooked whole grains mixed with chopped veggies and flax seeds [I also add sesame seeds right before and during molt]. For example, yesterday, they had blue curly kale and cucumber [they actually love the kukes if you make a thick slice of them and skewer them on the tip of branch] and cinammon flavored gloop. Budgies are ground foragers so putting their food on the bottom of the cage on a white paper plate helps a lot because it's the way they would eat in nature. And they LOVE LOVE LOVE leafy greens! Try putting the very heart of a romaine up high in her cage and make sure it's dripping water [they love to take a bath by rubbing their bodies on the wet leaves] and you will see that in a day or two, she will start eating it in earnest. BUT for them to eat a good diet, you can't free-feed them protein food because, if you do, all they will eat is the protein food and not anywhere near enough of the good stuff. What I do is give them the greens and the fruit/veggie first, wait about half an hour and then give them the gloop. As to the 'sleep' schedule... well, the thing is that it's not how many hours they sleep but how many hours they are exposed to light. Budgies are extremely opportunistic breeders [so much so that you will still find references in birdsites stating that they breed all year round] and, because we always feed them too well and always keep them in a steady good weather environment indoors, if you don't follow the solar schedule strictly, you end up with birds that are hormonal all year round -which is extremely unhealthy for them. Now, the key to a solar schedule is the exposure to dawn and dusk without any artificial lights on because it's the different spectrum that happens at twilight that turns on or off their 'internal clock' which, in turn, regulates their endocrine system. As to training... well, you are not going to like what I am going to say but please understand that it's nothing personal against you, it's that I care very deeply for birds and want them all to have the best possible life which, for a budgie, means living in a flock or, at the very least, having a mate. Lone budgies are unhappy little birds. Lots of people say "My budgie loves me and it's not unhappy" but it's wishful thinking because it's a known fact that undomesticated animals are not happy when they live a life completely different from what nature evolved them to have. So I would beg you to consider this. The other thing is that although you can train a budgie, what you can get from the bird is actually very limited because they are naturally flighty - and that's why she will not stay on your finger. Budgies have 'ants in their pants', they are always moving, flying, hopping, jumping, hanging from something, exploring a little cave, chewing on something, preening each other, etc. They move too much, their attention span is short and they are not, unlike companion parrots [budgies are aviary, not companion], fixated on one single individual [they are flock-oriented and not pair-oriented and, to put the icing on the cake, they are hardly ever hand-fed] so, although you can teach them to come to you, to perch on a finger, to take a treat from your hand, etc. you can't really expect them to stay still long enough for them to learn anything else because you would be working against their very nature. If you want a single bird that can be trained and would bond deeply with you, get a GCC BUT ONLY if you have the hours and hours they need of one-on-one during the day [can't do it at night, it screws up the bird endocrine system] because they are extremely needy little birds and need A LOT of personal attention [much more than other species]. And do consider adopting instead of buying. For one thing, we have a huge overpopulation problem with parrots and you wouild be part of the solution instead of contributing to the problem and, for another, the notion that one needs to get a baby bird to get it to bond is not true, all my birds came from somewhere else and they are all wonderful animals. Pajarita wrote: :lol: No 'horrible entrance' at all! Welcome to the forum, Ralf and Dido! Our other budgie, Pookie, a female as well who is 3,5 years old, wasn't as amused as we were with the arrival of Dido in our household. She shows a lot of agression towards Dido. Whenever we open Dido's cage, Dido will fly towards Pookie which is very normal ofc because they are flock birds, but unfortunately the interest is not mutual. Pookie will climb through the cage to peck at Dido (Dido is outside of the cage ofc), and when she does, Dido pecks back. Do you have any advice to make them tolerate each other and perhaps become friends? And to be sure about the light: Do you mean I only have to give artificial light (full spectrum) when it's light outside as well? Would that mean that since it's autumn now I will have to give her light for shorter amounts of time? Pookie tries to bite Dido's toes because that's what all parrots do to other birds that 'dare' perch on their cage. It's normal, all parrots do it. And it's not real aggression in the sense that, if you allowed Pookie to come out to fly with Dido, she will not attack her. All Pookie is doing is protecting what she considers her nest [because, if you have kept Pookie at a human light schedule -artificial lights on when it's dark outside- she is now overly-hormonal and regards her cage as her nest]. A solar schedule means a light schedule that follows the sun throughout the different seasons [think of the birds out in the trees and chickens: up with sunrise, to bed with sunset] so, yes, the days will be shorter in the winter and longer in the summer. It doesn't matter much to humans but it matters a lot to birds because the different lengths of daylight is what tells their bodies what they are supposed to do: start producing sexual hormones, stop producing sexual hormones, molt their feathers, migrate, etc]. Birds are the most light dependent animals there are. To them, light acts both as a nutrient and as a hormone. See, birds have cells that 'sense' light [they are called photoreceptors] inside their brains [humans and other mammals only have them in the eyes but, because light is so important to them, birds have them in the eyes AND inside their brains and nature made it so their skull bones are so thin that light goes right through them! Isn't that amazing?!]. When the photoreceptors sense light, they send a signal to their 'pituitary' [the 'master' gland that, in turn, sends signals to other glands]. During twilight [dawn and dusk], the light from the sun hits the atmosphere at an angle making it refract [this means that it changes direction] differently than when the sun is high in the sky changing the spectrum [range of different colors in the light -think rainbow]. It is this different light spectrum that only happens during twilight that turns on or off their 'internal clock' letting the body know how many hours were in between the two events [dawn and dusk]. The change in the number of hours is what tells their body what to do when. So, when you keep a bird exposed to artificial light when it's dark outside and do not expose the body to dawn and dusk, the body thinks it's spring and breeding season all year round, year after year. And this is not very unhealthy for birds because nature made it so their bodies need to rest in between breeding seasons. It's also unhealthy in other ways because the endocrine system doesn't only 'manage' breeding, it does much more than that - all the way to depressing the immune system when it's out of whack. So, the way to go with birds is no artificial lights on until the sun is all the way out in the sky and no artificial lights once the sun is halfway down to the horizon in the afternoon. You also have to make sure that no light reaches the inside of the cage after sunset because even a little bit of light would screw up the whole thing [there are lots of studies done about this] so what I do is I wait until it's dark outside and the birds are all roosting and I cover their cages completely with quilts, bedcovers or black out materials and to make double sure, I don't turn on any lights in the rooms where they are kept. But, thankfully, it will get easier for me when we fit the finished attic rooms for them because they will live cage free [no cages to scrub - YAAAAYYYY!] and the only light that will reach them is the one from the moon so I won't have to worry about covering anything. I am so sorry. I did not mean to jump on you. It is that this is repeated each time we get a new member. I was opening the door so others would come in with info. I don't think the OP was offended in any way by your posting, Liz. And you are correct in that we do need that information to answer any question so, if you had not asked for it, somebody else would have done it. Pajarita wrote: Pookie tries to bite Dido's toes because that's what all parrots do to other birds that 'dare' perch on their cage. It's normal, all parrots do it. And it's not real aggression in the sense that, if you allowed Pookie to come out to fly with Dido, she will not attack her. All Pookie is doing is protecting what she considers her nest [because, if you have kept Pookie at a human light schedule -artificial lights on when it's dark outside- she is now overly-hormonal and regards her cage as her nest]. Thank you again for these useful loads of information! I hope I can correct Pookie's behavior by letting the light with the seasons. I always thought it was weird her cere stood brown, but ofcourse it were te hormones. Would it be possible to adapt after all these years? And how long would it take? Enjoy your attic by the way!! I would love to be able to give them a whole room for themselves. Don't worry, you probably helped me a lot! Got a lot of information out of it! I just didn't think of it. Yes, Pookie's endocrine system will revert to following the seasons but it doesn't happen overnight, in a week or even a month, it takes longer. But, in reality, it doesn't even matter because this is something that you will have to do for all birds during all their lives.